NFL Team Helmet Vending Machine Sticker Refill 300 ct.
300 Count refills for your flat vend tattoo and sticker vending machine. 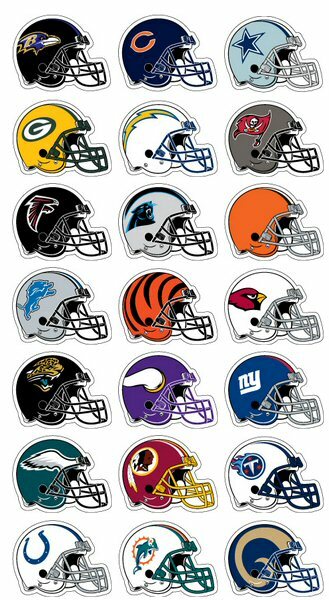 People won't question who your favorite team is when you get these NFL Team Helmet Stickers. Each sticker displays an authentic NFL helmet. Same color and styles as the real thing. Put them on your phone, binder, car, or just about anywhere. Collect all 32 teams or just your favorite one! These vending machine stickers are made specifically to vend in most standard sticker or tattoo flat vending machines. Each sticker is packaged in an individual protective cardboard folder measuring approximately 4 1/2 x 3 inches. They are ready for your convenience to easily load or refill your bulk machines. Each individual column of a standard flat bulk vending sticker/tattoo machine requires one box of 300 stickers to fill. Check out our other designs and be sure to order enough boxes for all of the columns in your machine. Display card available for nominal additional cost. See options.